As they complete their term tomorrow, the cabinet ministers will hand over their duty vehicles and office equipment, said the prime minister. He was speaking at Meet the Press session yesterday. The ministers will also surrender their Kabney and Pata (ceremonial scarf and sword) along with the Members of Parliament tomorrow at the National Assembly amid a small ceremony. The ministers, however, will remain in office until an interim government takes over, but will wear the regular white kabney to work. “Since we are required to serve as cabinet ministers till the formation of the interim government, we will continue to use our laptops and offices. As soon as the interim government is announced, all official equipment, down to the last pin, will be handed back,” the prime minister said. “In the previous government, all ministers were authorized to keep their laptops, computers and printers. This is not a good precedent,” he added. According to the constitution, an interim government must be instituted within 15 days after the dissolution of the government. 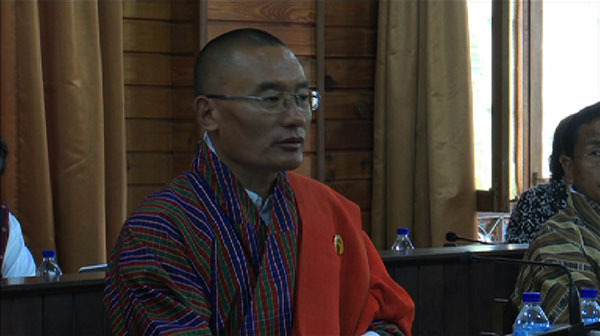 The prime minister said the ministers will also vacate the Lhengye Dhensa or the ministers’ enclave. “We are first and foremost MPs, so all of us will move out of our official residences latest by the 1st of August. The previous government didn’t set a good precedent. They lived there even during the campaign,” the prime minister said. He added when the Lhenga Dhensa was handed to the current cabinet ministers in 2013, it was in a bad shape and a lot of repair works had to be done.